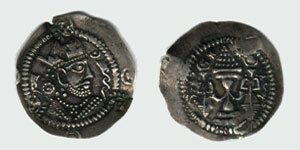 Drachm of Sassanian king Peroz 459-484 A.D. Obv. : Bust of king right. 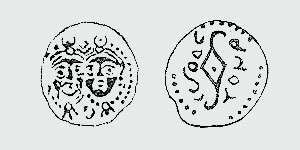 Countermarks in the field: above right made by Bactrian italic script "cdho", below right countermark-tamgha (of Turkic rulers ?). AR 25 mm., weight 3.1 gram. 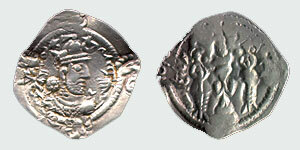 Drachm of Sassanian king Khosraw I Anushirvan 531-579 A.D. Obv. : Bust of king right. 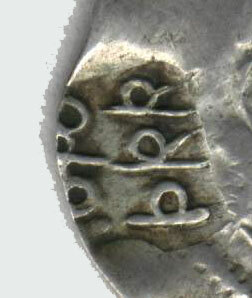 Three portrait counterstamps around the coin's edge and counterstamp with name and title of local ruler made by Bactrian italic script "sarrocdho", in left field. Rev. : Fire altar, attendants (mobeds) on both sides. Countermark in two lines "painoicdho", made by Bactrian italic script in left field. AR 26 mm., weight 2.5 gram. Obv. : Bust of king right. 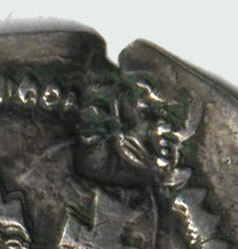 Around the coin's edge, three portrait counterstamps and counterstamp "sarrocdho" below made by Bactrian italic script with name and title of local ruler. 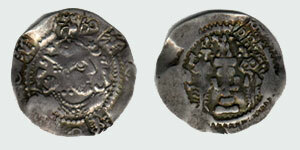 Counterstamp includes two elements together, portrait of a local ruler covered by a tamgha (of Turkic rulers ?) to the right. AR 25 mm., weight 2.4 gram. 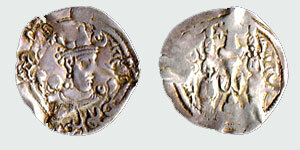 Chaganian imitation of drachm of Sassanian king Khosraw I Anushirvan, late 6th - 7th centuries. Obv. : Bust of king right. 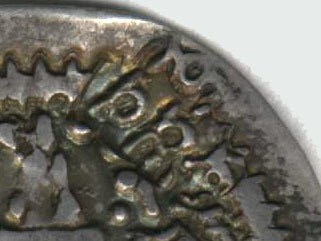 Three portrait counterstamps counterstamps around the coin's edge. Rev. : Fire altar, attendants (mobeds) on both sides, distorted pehlevi legend near mobeds. Countermark "painoicdho" in left field, made by bactrian script. 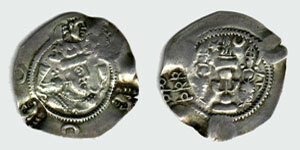 AR 26 mm., weight 2.6 gram. Obv. : Bust of king right (more stylized). 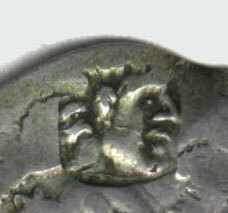 Three portrait counterstamps around the coin's edge and counterstamp-legend "zarinocdho" above. Rev. : Fire altar, attendants (mobeds) on both sides. 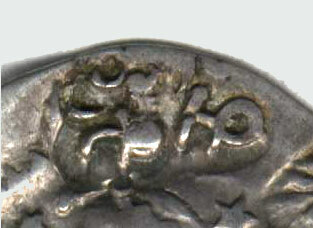 Counterstamp "painoicdho" in the right field above, made by Bactrian italic script in two lines. AR 27 mm., weight 2.5 gram. 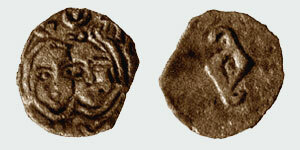 Chagankhudates. Second half of 7th century. Obv. : Bust of king right. 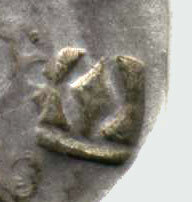 Three portrait countermarks around the coin's edge. Rev. : Fire altar, attendants (mobeds) on both sides. 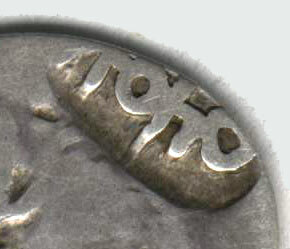 Legend made by Bactrian italic script near mobeds. 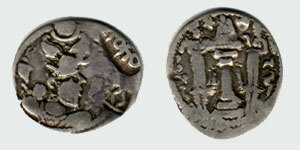 There are two types of Chagankhudates coins: unepigraphic - without a legend; and coins with Bactrian legend on their reverses: "cnaro cdho" - "Khnar khidev". or, probably, "hnaro cdho" - "Anar khidev". Obv. : Double portrait of king and queen. Rev. : Tamgha in the center, legend on both sides. Rev. : Tamgha in the center.